A mostly sunny pattern will continue Tuesday with only an afternoon thunderstorm possible. Any storms that do develop will head inland quickly. Highs will top out around 91 Tuesday afternoon, which is average for early July. Shower and thunderstorm chances will be suppressed for a few days as high pressure and a dry atmosphere dominate the region. The Fourth of July holiday will be steamy with highs at 91 and only a chance for a mid-day storm. 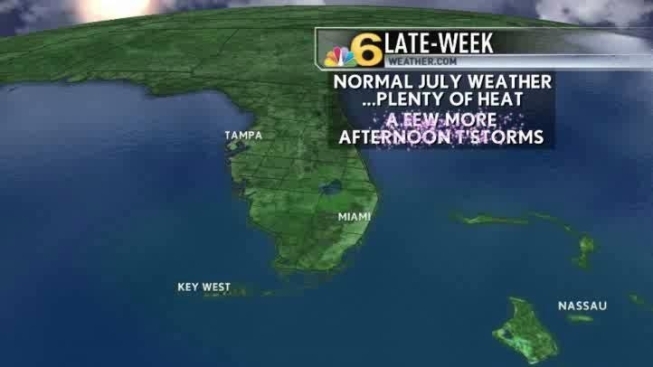 Conditions across South Florida will be dry in time for evening fireworks displays.